India's mutual fund (MF) industry witnessed unprecedented growth in CY2018 even though the credit market was recently roiled by a financial scare. The growth story was heartening, though, as assets under management (AUM) touched an all-time high of 25 lakh crore in August while total inflows into equity MFs stood at 1.1 lakh crore at the end of November. The surge took place in spite of muted returns from equity schemes compared to the previous year and the market upheaval from September onwards. The dream run of the equity markets came to a grinding halt when Infrastructure Leasing & Financial Services (IL&FS), a vast conglomerate that funds infrastructure projects, defaulted on its debt repayment, raising concerns over liquidity crunch. Booming oil prices, a rapidly depreciating rupee and increasing trade tensions between the US and China further dampened market sentiments. The S&P BSE Sensex corrected around 14 per cent, or 5,000 points, from an all-time high of 38,889 in August and dipped to 33,349 in October. In spite of the shock waves and the following roller-coaster weeks, equity markets managed to recover considerably by December. The S&P BSE Sensex came up with 9 per cent returns for the year (until December 10). However, equity funds delivered an average return of -5 per cent during this time frame. More interestingly, Indian investors stayed put in equity funds although the pace of fresh investments slowed down. In line with the growing retail participation in equities over the past two-three years, monthly investments via SIP more than doubled from 3,122 crore in April 2016 to 7,985 crore in November 2018. 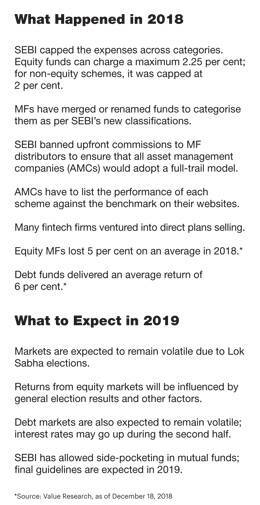 "The year 2018 was an interesting period for equity MF investors. We saw a distinct change in their investment behaviour and that augurs well for their wealth creation prospects in the coming years," says Swarup Mohanty, CEO of Mirae Asset Global Investments (India). 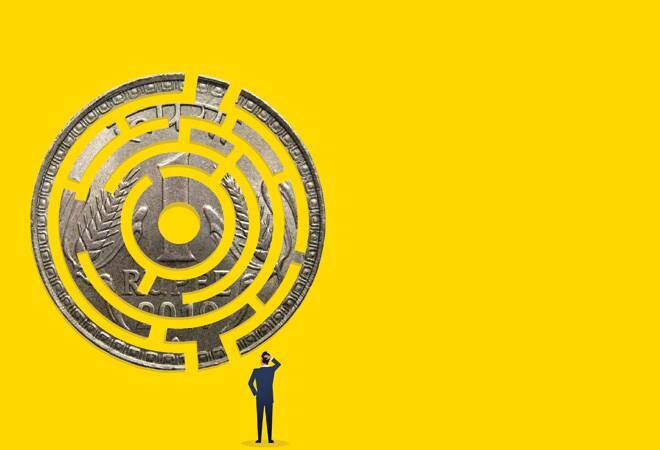 "Now people seem to be recognising the long-term potential of equity as an asset class and they have also demonstrated increased faith in mutual funds as an investment vehicle. Not only did they stay invested throughout the year, but also continued to add money via SIPs and lump sum investments. This (kind of risk appetite) is exactly what was missing during previous falls when investors used to leave the market." Debt funds have outperformed equity funds in 2018 as the former delivered average returns of 6 per cent. Incidentally, the Reserve Bank of India increased the interest rates twice, leading to a hardening of yields that impacted bond prices. While debt funds do better in a falling-interest-rate scenario, rising yields from debt papers mean newly issued ones will offer higher interest rates, leading to a fall in the prices of existing debt papers and impacting the NAVs of mutual funds. Debt funds, too, had their share of volatility. "So far, 2018 has been a volatile year - in terms of interest rates and on the credit front. With yields rising, investors in debt funds had to bear the mark-to-market (MTM) impact, which led to reduced returns. As a result, liquid funds under the debt category are better placed in terms of returns," says Lakshmi Iyer, Chief Investment Officer (Debt) and Head, Products, at Kotak Mahindra Asset Management Company. Liquidity concerns have also raised corporate credit spreads, making credit funds more attractive to investors who are willing to take some risk. "We are currently advising investors to look at short-term investments. Liquidity concerns have bumped up corporate credit spreads materially and hence, offer investors an ideal entry point into credit funds and roll down investment strategies," says R. Sivakumar, Head, Fixed Income, Axis Mutual Fund. In a bid to tap the do-it-yourself investors, a large number of fintech companies selling direct mutual funds plans have entered the market in 2018. For instance, Paytm, India's biggest mobile wallet company, has launched a platform called Paytm Money on its mobile app to get into selling direct plans. However, many of these are transaction-only platforms and only a few offer advisory services. In 2019, it is expected that more new players will enter the space. Fund houses have recategorised and renamed their funds to abide by the category rules introduced by the Securities and Exchange Board of India (SEBI) in 2017. In 2018, SEBI has also rationalised expenses across fund categories, taking into account the increasing AUM under MFs to provide economies of scale. As the securities market regulator has capped the expenses across categories, equity funds can charge a maximum of 2.25 per cent and non-equity schemes can charge 2 per cent. Also, SEBI has banned upfront commission and asked fund houses to follow the full-trail model. SEBI has also allowed side-pocketing, which enables MFs to segregate a fund's holding in stressed assets from the rest of the holding and cap redemptions. The regulation came in the wake of the recent crisis when IL&FS and its subsidiaries defaulted on interest payments, leading to rating downgrades and price falls. Consequently, MFs holding the papers of these companies registered huge losses. As per the new regulation, post the segregation, bad assets will not be allowed for subscription and redemption, but the rest of the portfolio will remain open for it. Whenever a fund can sell the bad securities and recover the money, the same will be paid to the people who had invested in those assets before the default. The final guidelines are expected to come out in 2019. With the general election scheduled to be held in 2019, the market is likely to be range-bound. "Due to Lok Sabha elections, volatility is here to stay in the near term," says Aditya Makharia, Head of Research at Motilal Oswal AMC. However, people should leverage this opportunity and continue to invest as per their asset allocations and in sync with their goals. "Investors need to understand that in volatility lies the opportunity. In choppy markets, SIP investors stand to gain as they continue to accumulate MF units at good prices. The more units one accumulates, the better the wealth creation in the market upside. Therefore, investors should stick to their asset allocations and stay invested," says Mohanty of Mirae. On the debt front, it will be better to stick to short-term funds. "For short-term requirements, one should stick to the ultra-short category. And whatever be your risk appetite, stick to your asset allocation, which is non-negotiable, especially in troubled times," says Iyer of Kotak Mahindra AMC.